Schedule Meetings. Stay Organized. Manage Effectively. The Fly-In Manager is an online application that contains a unique suite of tools designed to help you coordinate your fly-in from start to finish. Built with the help of advocacy professionals, it offers solutions to the real problems that arise when planning and executing a successful event. We also offer tools for registering attendees for your fly-in and collecting feedback from your attendees after the event. …Fly-In Manger was a star. The system performed extremely well…your customer service support was outstanding…and our members were thrilled both with the app and the printed information we provided them for their Hill visits. I want to commend you and your team and convey how pleased we are with the investment we made. The Fly-In Manager was a key tool to ensure our Advocacy Day participants had a productive Advocacy Day. 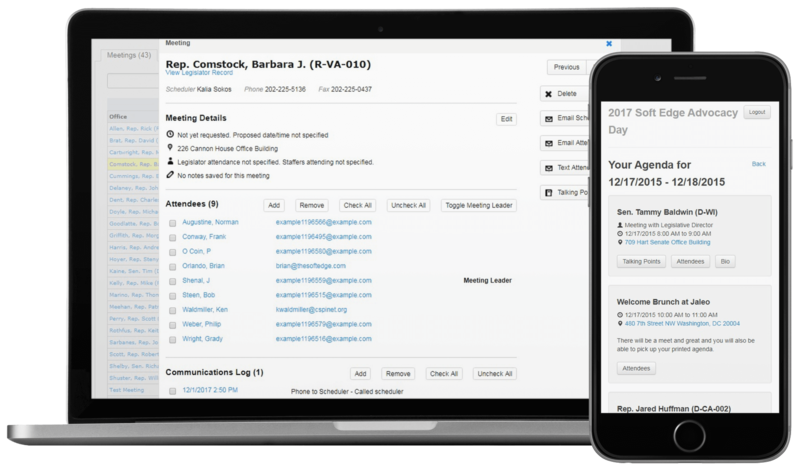 One component in particular, the mobile app, helped us keep all of our participants informed, in real time, about schedule changes while they were on Capitol Hill. Using the software we were able to execute a perfectly seamless day of meetings for all of our participants. The application is flexible, easy to use and brings together all the moving parts to make our Washington event much easier both for our staff and our attendees. Find out how our software can help your fly-in be less stressful. We can help you get started right away.